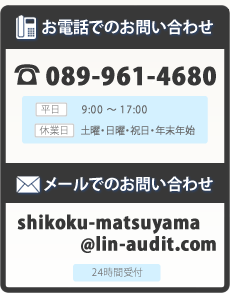 Shikoku Matsuyama Lin Audit Co.
responsibly so that our clients proceed in the right direction. Should it be necessary we will take the initiative to help to lead. 1. Even though we are a small sized local audit firm, two of us have substantial overseas experience in global sized audit firms, so we can cater for clients at home and overseas. Actually one of our clients is a subsidiary of a Taiwan listed company, and we advise them based on IFRS. 2. Prefectural Overall Audit, Balance Sheets of Local Governments, Advisory services related to Public Organization System Reform, Consulting for NPO Organization. 3. One of our partner is doing internal statutory audit as external director for one listed company. He acts an important role for accountancy, management, taxation and internal control system and so on. So our audit corporation has great insight for such sort of fields. Copyright, Shikoku Matsuyama Lin Audit Co. All Right Reserved.